Thank you Mr. Lash we are happy you placed your trust in us for your flat roofing needs. If you should ever need our services again or construction services please do not hesitate to give us a call. Relationship: Our project has been put on hold at the present time, but I would definitely hire Blair/Randy Savage for our roofing project, if the decision becomes mine to make! 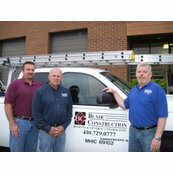 Blair is highly professional, and more importantly, a trustworthy company. They have completed several projects at my home and I highly recommend the company. Blair construction replaced our roof and did a great job! They were very professional and did a wonderful job, we would definitely hire them again. Our experience with Blair Construction was the replacment of our roof shingles.